Are you ready for Love Entwined? 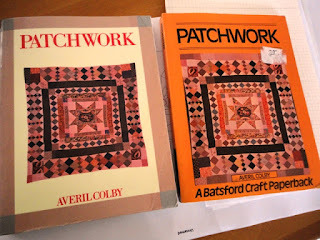 These quotes are from 'Patchwork' by Averil Colby (if you dont already own this book, it's a quilting staple, I urge you to seek it out) and are discussing a very special and historic quilt, known only as 'a fine marriage coverlet'. 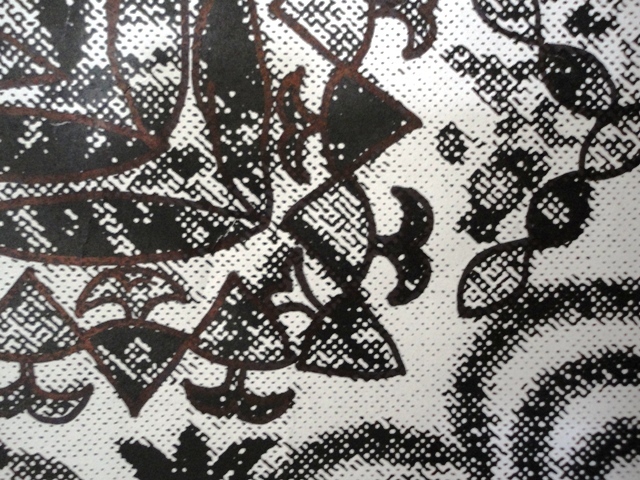 The whereabouts of this coverlet is not currently known, nor has it been seen or exhibited publicly (to the best of my knowledge) since being featured in this 1956 publication. 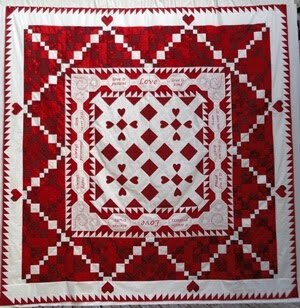 This quilt is a historic quilt and of great importance to both women's work and quilting history. 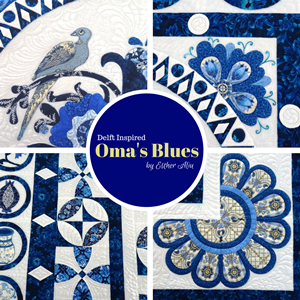 It is my hope that this BOM will revive interest in this quilt to the extent that its whereabouts will be discovered so that it may be preserved and archived and acknowledged for future generations as the piece of history it undoubtedly is; this quilt is a legacy. Making the BOM? Grab the button! I have finally put down my pen, decided on some fabrics (for the time being anyway) and am ready to start the Love Entwined adventure. It feels like it's been such a long time coming...and in many ways, I could certainly keep working on this quilt for the equal measure of time all over again. But the thing with making the Love Entwined pattern is this: you don't so much 'finish' it as reach a point where you can't go on any further alone. 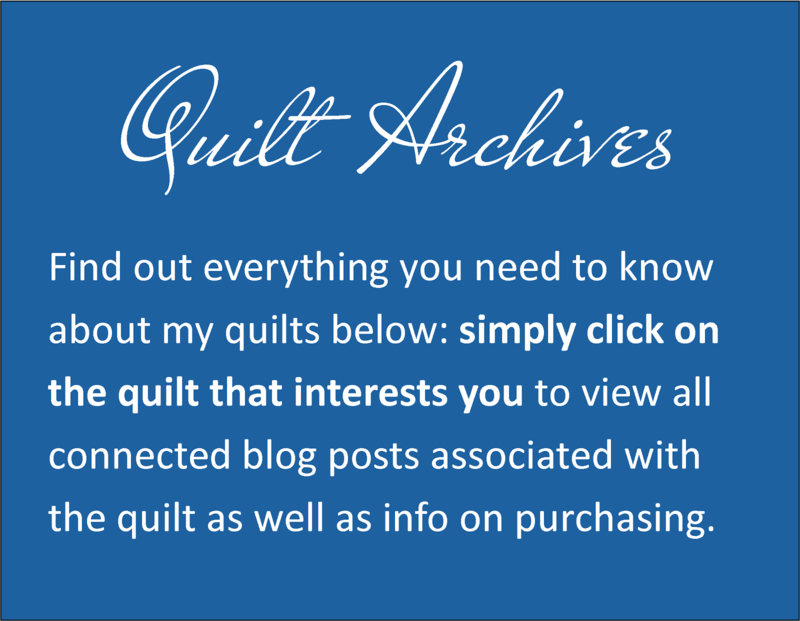 I've spoken in previous posts about how Love Entwined is not a 're-manufactured' quilt pattern, and it simply couldn't be - I don't have the original quilt, nor have I ever seen it in person. There's been much I can only ponder and guess whilst going forward in my own style. 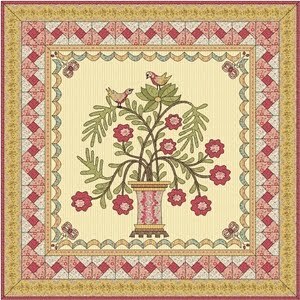 Yet having said that, it is a historic quilt and this means I have reigned myself in and stayed as true as I could to the design. And now it's finished. And I'm as ready as I will ever be. 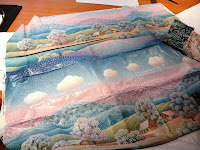 What I need now is to get on with making this quilt and sharing the journey with my Yahoo Bom Group. I'm already looking forward to exchanging thoughts and ideas about each block and seeing how you all interpret the blocks in your own special way (like you always do). 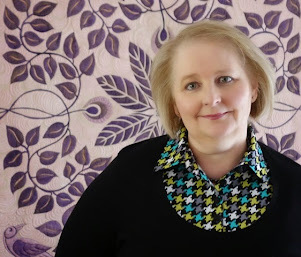 My Yahoo Bom Group has come to mean so much to me - it's not just the place I share my patterns, it's where I continually grow as a designer and as a quilter. Especially now. 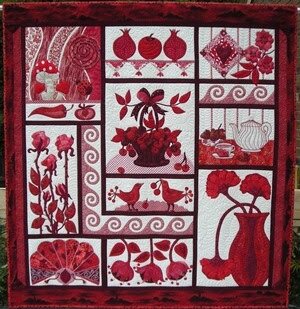 For Love Entwined is a very special quilt. 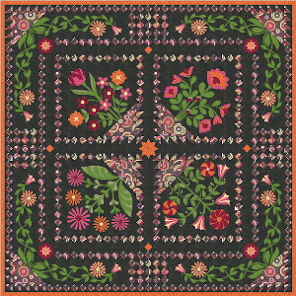 It was once special to a specific woman in her own time and place in history, and it is now special for several different reasons: for it's marking of time and place in Georgian history, women's history and quilting history. Very special indeed. And this makes sharing it with you all so much more important to me, for this, unlike other quilts, is not a sole journey to be undertaken alone. It is a personal satisfaction, but one to be shared. 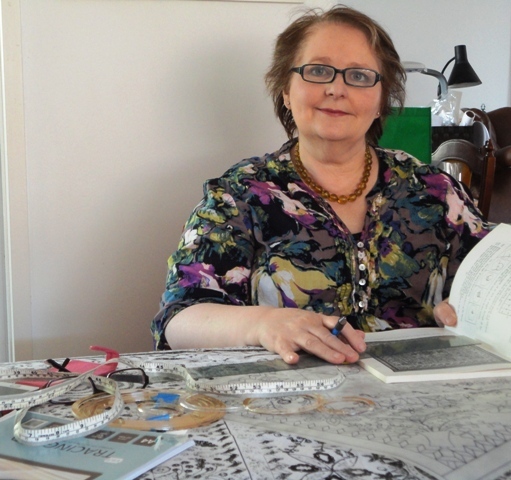 It's a journey I am looking forward to undertaking with others and hopefully we'll create this beautiful fragment of history - all in our own special ways- and revive it's legacy through different cultures, different countries, guilds, groups, and in our own unique space, one quilt at a time. I feel like I've been in a Georgian whirlwind this past week! Usually I like to quilt for 3-4 hours a day during the week with weekends reserved for family time, but these last few days I've been onto this subject and pattern with all day intensity. 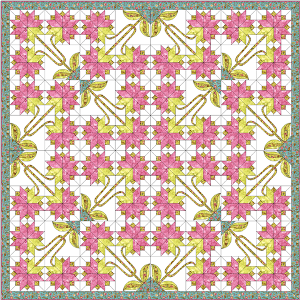 I came across a clearer image of the 'love coverlet' and decided to make some changes to my pattern. Whilst this BOM is not a re-manufacture of the original, I don't want unnecessary elements outside the style theme in there! I thought I saw birds, there weren't birds, they had to go. It's all for the benefit of the quilt and worth the extra waiting time. I do apologise for those of you on the edge of your seat, waiting for the first block, I understand! I felt exactly the same when I started the pattern, it gets under your skin. 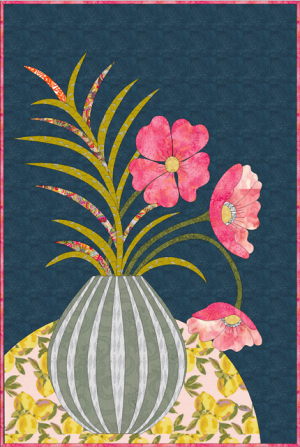 I'm still debating whether to go with a light or dark background (leaning towards light) but it will depend on the tone match I can find when I buy my chintz range. I will post details once I have decided where to purchase. In the last few days I was lucky enough to come into some Chintz a friend was willing to part with and can see some good colour ways here - for fussy cutting and graduations, like flower petals. The Yahoo BOM Group has had 250 new members join in this last week and I know we're all excited to make a start, I'm sorry to keep you all waiting, but with my new image 'updates' I felt I had no choice. 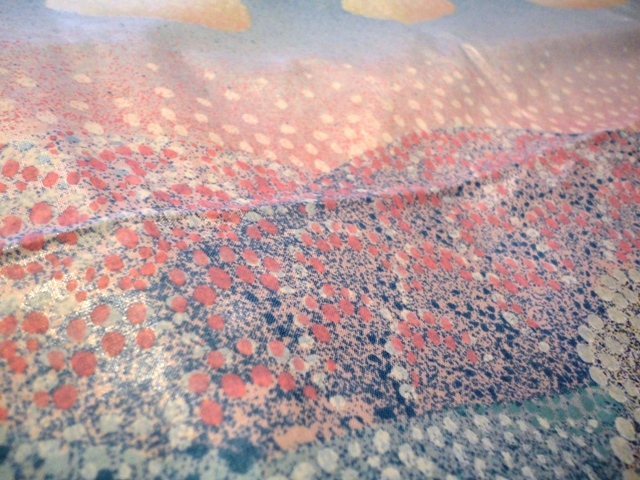 The energy around this quilt already feels so wonderful, some quilts just have that 'something' about them which makes creating them extra special and I already know that this 'one' is one of those and we haven't even started yet. I am beginning to think to myself, what have I started here with Love Entwined? The energy around this quilt is so enthusiastic and keen, I love it, but I also can't ignore how much I completely underestimated everything about this quilt: the time it would take to create the pattern, the time it would take to break down into a BOM, the interest it would arouse, and (most frustratingly of all), the time it would take to select fabric for this quilt. 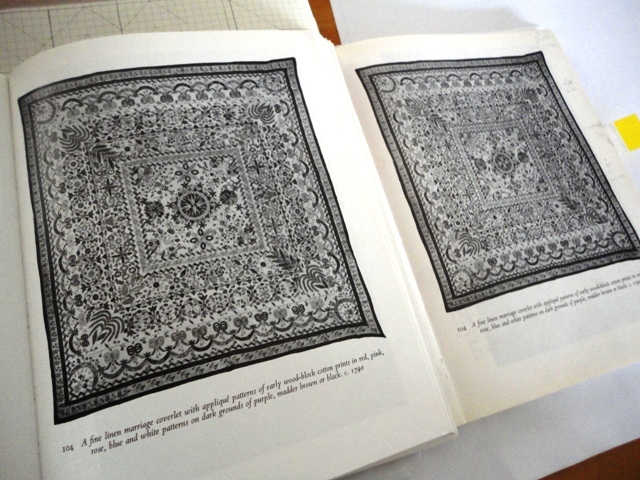 You see, a friend showed me her Patchwork edition of 1958 (I'm amazed how many quilters have this book in their library, isn't it great?) and the image is much clearer than my own, in the 1956 edition. Can't believe the clarity difference! Already I've scrapped 2 birds I was sure 'were there' but in the clearer image have proven not to be. the previous working sketch, I've already updated it! 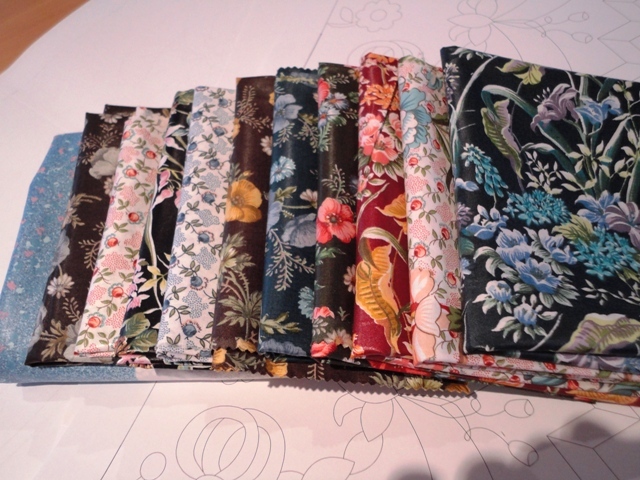 A lot of you are asking if I can put up the fabric requirements for the BOM so that you can go ahead and purchase your chosen range. 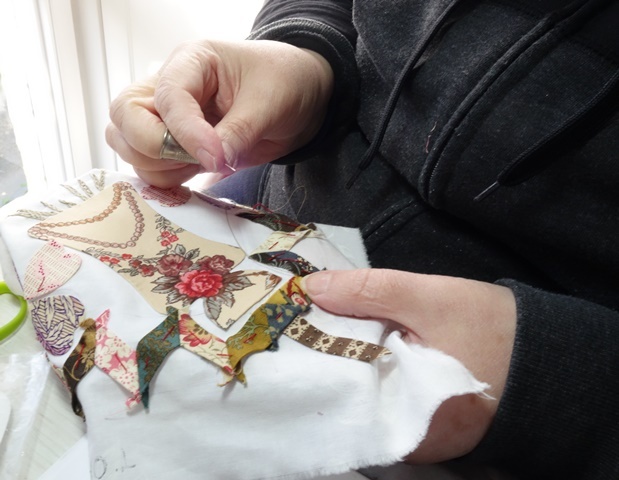 All the fabric requirments and break downs will be provided in full in Part 1 of the BOM. I will not be adding snippets of info on fabric requirments anywhere else first as I have learnt from previous BOMs that this only leads to confusion. I know we're all impatient to start and will be updating this blog as soon as I am ready to launch! 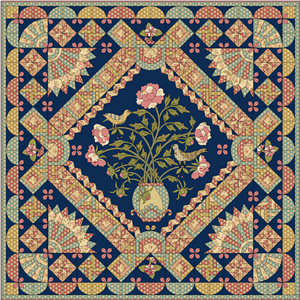 The idea of a Georgian quilt has quite gripped me. Of course, I'll select whichever fabrics and colours I love best, but that hasnt stopped me developing a keen interest in the Georgians. And it's true, if I can find a Georgian 'theme' that I really love, that's what I will be going with. 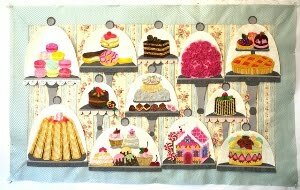 This Georgian style board is from Anita Brown's blog (who has given me permission to post it here for your enjoyment, thanks Anita). The blue and pinks are spot on for this era and give a great feel for the tones I’m seeking out right now. This image is a link to the British Library info page on the era. It's fascinating, I have spent hours reading through all the sections and highly recommend it. I haven't read it yet, I cheated and watched the BBC TV show made from this book below (from the library) last night and have purchased it this morning. Again, it's fascinating and I can't wait to go over what I saw, in print. Now I have a real feel for Georgian taste, I do wonder if I will stay true to the style or do my own thing, or a mix of the two? I don't know. 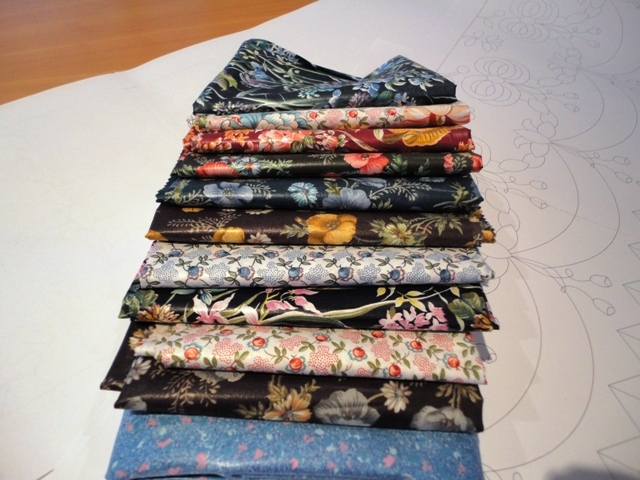 As soon as the fabrics are selected, it will be time to release the first block. Well it seems several of you have enthusiastically taken up the call to find this treasure of a quilt! What a faulous response and to keep us all up to date, I will list what has been investigated so that no one need double up or spend time unnecessarily. Please email me directly OR leave a comment to list any searching you have undertaken below this post and I will keep updating it until this quilt is found. Well, I think it's time to announce that Love Entwined is my next Free BOM! Taken from 'Patchwork' by Averil Colby. Published 1956. 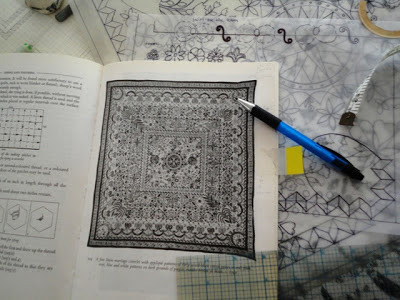 Each new BOM is an opportunity for me to accomplish a quilt from my quilting To Do List. I talk about this ‘list’ a lot, it drives me to trying new things and styles all the time. Although I think I already have a personal style of quilting design (we all do), I’m still growing as a quilt designer and I won’t be satisfied until I have completed ‘The List’. 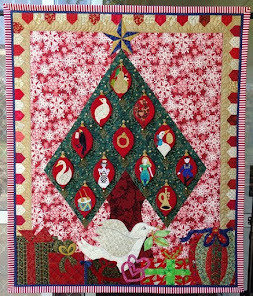 Just the other day, a new member in my Yahoo BOM Group commented in the sign –up section that she wanted to create 100 quilts before she died. I read that comment and nodded enthusiastically, it’s such a great idea to constantly be striving towards something and I’m glad to know that I’m not the only one motivated by a personally set finish line! The two BOMs I am releasing the next few weeks are quite different. 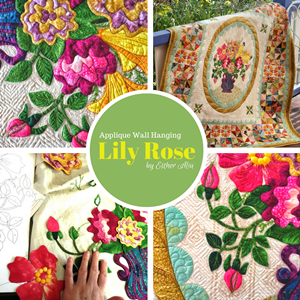 Rose, Cherry & Lily is an applique quilt with a pieced centre and is unapologetically romantic. I’m already in love with it and it looks like I’ll be making two from the very start, one for each DD. 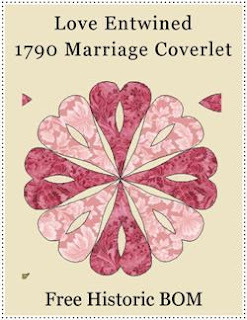 But the focus today is on the first BOM which will be released this month, and that BOM is Love Entwined: 1790 Marriage Coverlet. 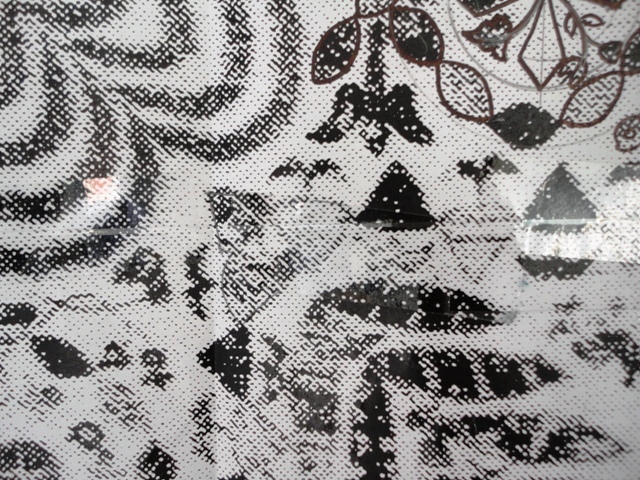 This is an enlargement from the only photograph I have been able to find of this quilt. It’s a very special quilt, full of mystery and intrigue as far as I’m concerned. 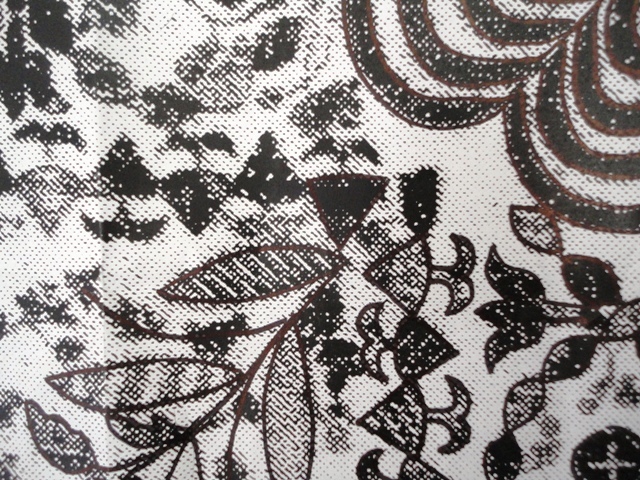 The only known photo of it is from an Averil Colby book “Patchwork’ printed in 1956. The photo is not great quality and it’s in grey scale. This should have deterred me from attempting to re-create it, but it hasn’t! I think I must live by the motto: an adventure isn’t complete unless it’s challenging as well! This quilt has been a true labour of love. First, the work. I have a lot of quilting experience and even I grossly underestimated the time required to draft up, as accurately as feasible, this quilt. Then, with all my hard preliminary work out of the way, I thought I'd go ahead and try to create it in EQ7. I did. Then disaster struck. I encountered a 'polygon error'. My quilt was gone. Just like that. GONE. I took a week out to recover from the lost work, I was frustrated and unsure if I would persist. I'd already invested so much time and taken time out of my life to create this pattern: was it better to cut my losses or try again? I decided to persist or I knew I'd regret having nothing to show for my hard work. Spending so much time alone with a design makes you think a lot about it's original work up. I’ve never seen this quilt in real life or in colour. I have searched for it, but it’s been very hard to track down – if it still exists. I really hope that somewhere, it does. 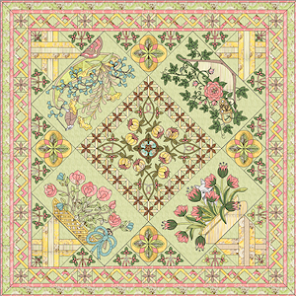 Of course, a real issue with it is that it has no name to reference, and is simply referred to as: ‘a fine marriage coverlet’ and is dated 1790, placing it in the Georgian era, England. 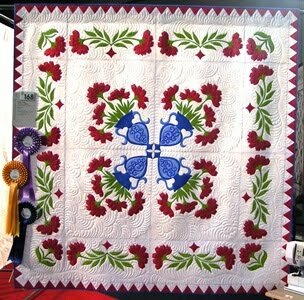 What is the allure of this quilt? I can’t quite put my finger on it. It’s not 'perfect'. 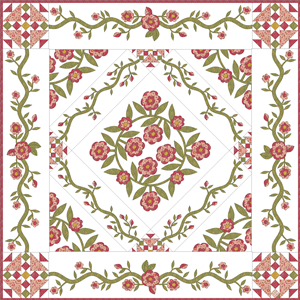 There are some design flaws which made re-creating the pattern difficult; I had to make choices when several options were available, which I will point out in the pattern specifically as the monthly blocks are released. And yet, I persisted. 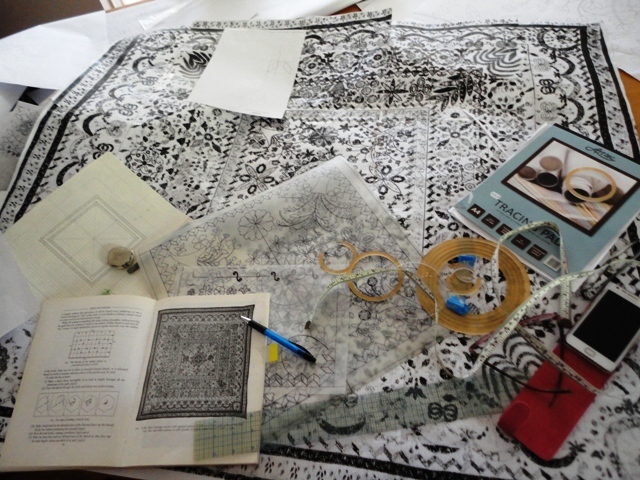 In fact, the more time I spent with this quilt, the more purposeful the design appeared to be and the more keen I was to do it justice and revive it in some way. 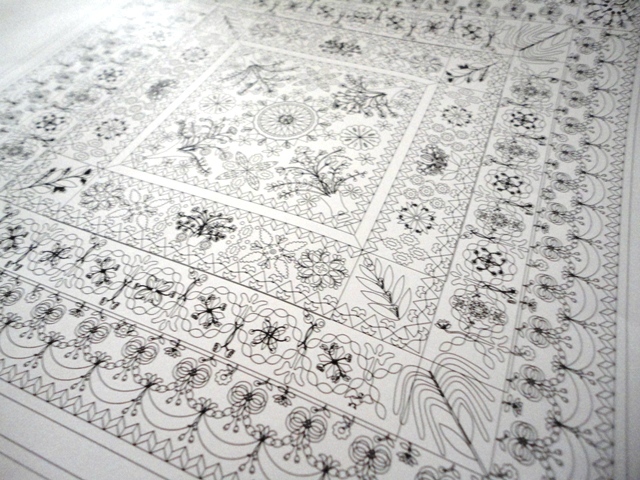 I have spent months and hundreds of hours painstakingly tracing, as accurately as possible, the original quilt. Working from a grey scale photograph is difficult and there were points where I had to create options when they literally couldn’t be seen. This quilt is not a ‘re-manufacture’of the original, it could never be that. It’s my interpretation of the original, through my own eyes. 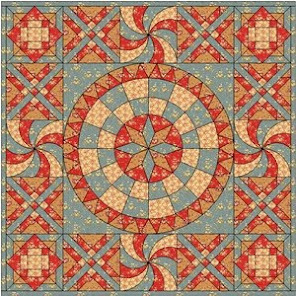 Of course, every quilter infuses every quilt they make with a certain style or character, you see this when you look at the same quilt pattern made by different quilters, and it’s the same here. Some aspects of my own style have crept in, it’s unavoidable. 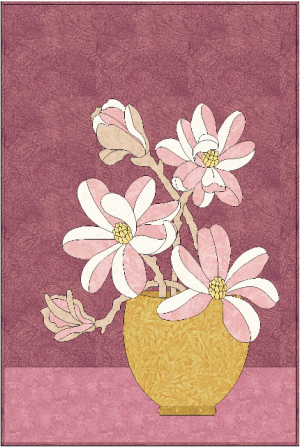 But this is most definitely a historic quilt, which I have interpreted and re-created in order to be made and enjoyed for it's historic value and beauty. 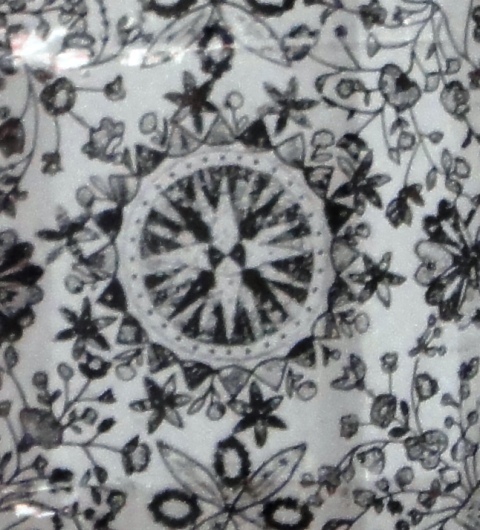 As a quilter I have noticed details, such as broderie perse cutouts, which I am assuming but can't be completely sure of, and stitches inbetween shapes and other flourishes. I've been drawing things my own way, keeping as close as possible to what can be seen. The rest I have had to imagine and improvise, keeping in theme with the style elements dominant in the design. 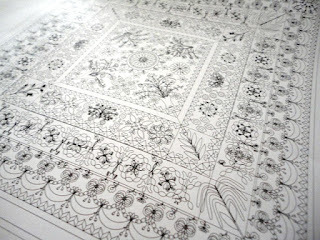 The longer I spent on this quilt, the more attached I have become to it's design and it's designer. Details I looked over initially have come to have an important place in the scheme of the quilt. 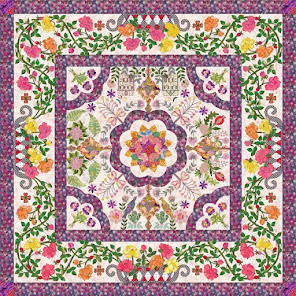 Take for example the bow border around the quilt; I never really loved these and assumed (years ago) that I would change them to something else if I ever made this quilt. But after spending so long entrenched in the design elements, changing anything became impossible. Although I make each quilt to satisfy something in myself ( and although I enjoy sharing what I do with you, my fellow BOM Group quilters), this historic quilt is more than a satisfaction to me. It’s homage to the unknown woman who made it. So I found that when I reached the bow border, I couldn’t change it – I didn’t have the heart to. Here I am with a mock up of the pattern. I'm afraid you can't see much, but I can tell you, this quilt grows on you and I am more keen on it today than I was when I started. 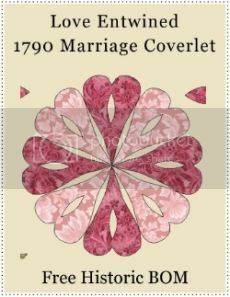 Love Entwined: 1790 Marriage Coverlet is an intense applique quilt project: it’s not for the faint hearted and I don't recommend it for beginners. 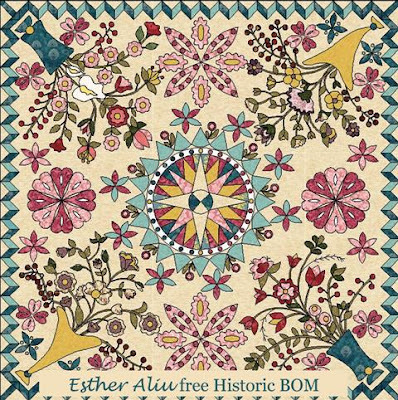 As I mentioned, this will be a one in a lifetime quilt for me and I want anyone considering making this BOM to really be aware of the dedication involved to seeing it through to completion. 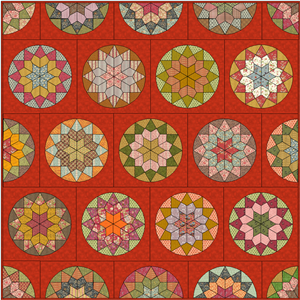 This BOM will run for 18 months (more details later in the week) and is definitely one of those quilts that simply can’t be rushed. For those of you who know this is just too much for you, don’t worry, the next free BOM Rose, Cherry & Lily is up next and is decidedly easier… there’ll be something for everyone, BOM wise, this year. 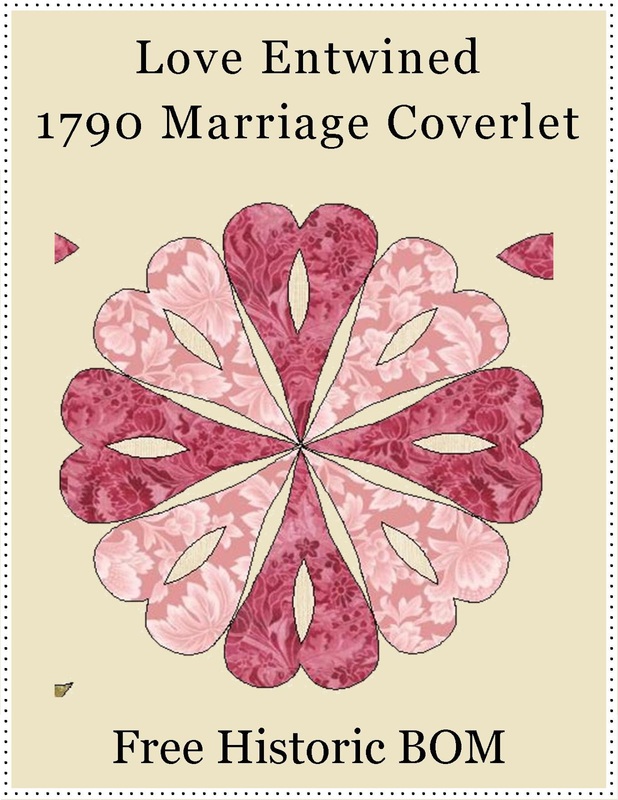 So this is a brief introduction to Love Entwined: 1790 Marriage Coverlet, my first historic quilt. 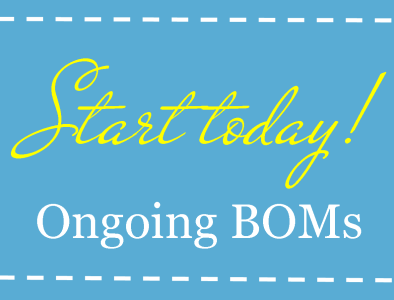 I'm excited about releasing it and like always, this BOM will be free for the first month of each block release. 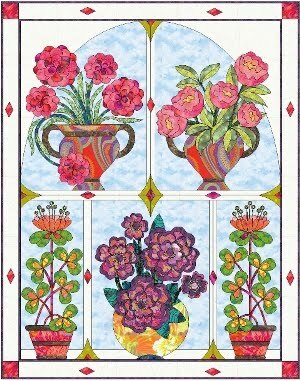 Would you like to make this quilt? I have created Love Entwined: 1790 Marriage Coverlet to be released as a free, 18 month historic BOM. Everyone is welcome to make it, including groups. 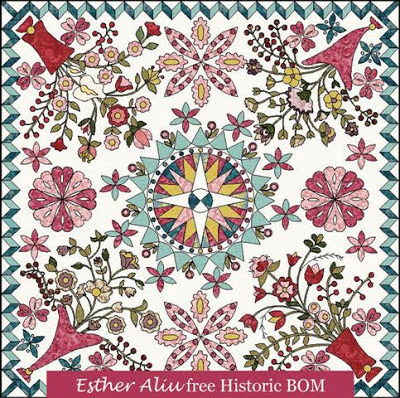 The pattern will be available for free (limited to the block each month)download via the Esther Aliu Yahoo BOM Group only, after launching. Membership is, and always will be, free. Why not join us today? 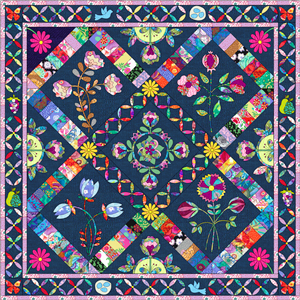 I would like to call on all quilters, especially in the UK where this quilt was made, to look into your guild archives and groups and associations and find this beautiful, historic quilt. It must be somewhere. 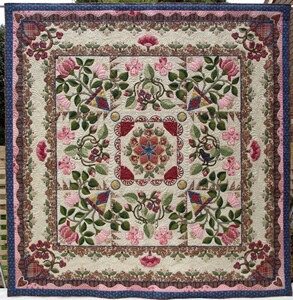 It's last reference is it's owner ( Mrs. Erith of Dedham) who granted permission for it to be included in the book 'Patchwork. It's important enough to have been featured in Averil Colby's book - so we know it has significance, but where is it? 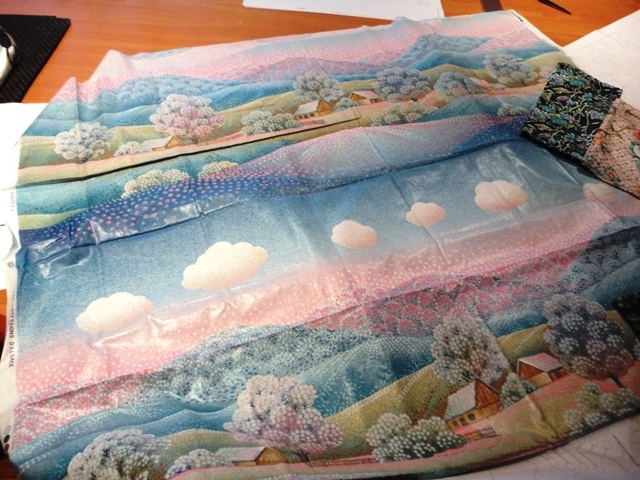 What do we know about this quilt? We don’t know much about the original historic quilt known only as ‘a fine marriage coverlet’ in Averil Colby’s book “Patchwork’ published in 1956. If it is featured in any other publications, I don’t know about it and haven’t been able to source it. 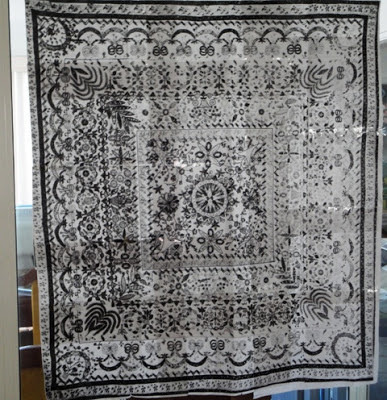 I must admit that there is a part of me which hopes someone out there will recognise it and that this might lead me towards seeing a more detailed image of this beautiful Georgian quilt. I hope it is waiting somewhere, safely archived until being re-discovered as the fine work of beauty it most certainly is. The following extracts are from Averil Colby’s book ‘Patchwork’ printed in 1956 (ISBN 07134 0392 6). 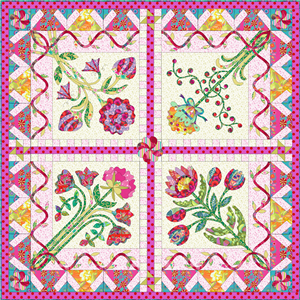 All quotes are mentioned here to provide context for quilters interested in creating the quilt featured in this publication only. If you can source this difficult to find book I strongly suggest you do so. 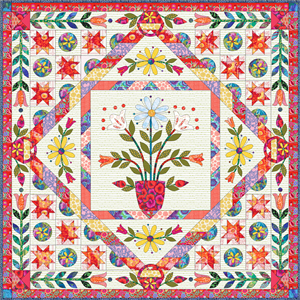 It contains a wealth of information regarding the progression of quilting (many quilts, the reference to this quilt is minor) as well as discussing the importance and value of numerous style elements. 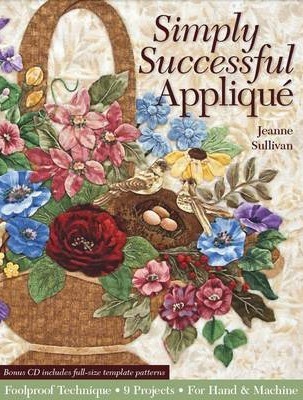 It is a treasury for quilters and one of my most loved quilting books. 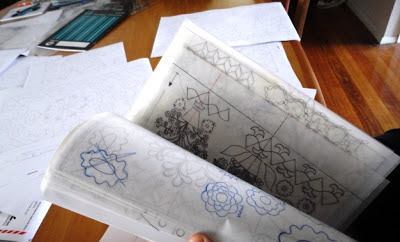 As I had to work from limited information, I stayed as faithful to the design as possible. 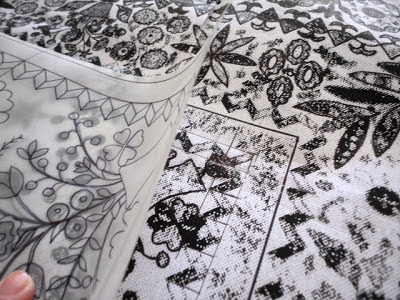 But questions remain – such as the fabric choices and story behind the elements and details used throughout the design. 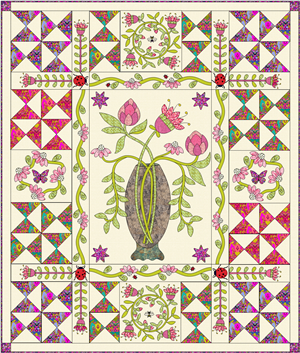 This quilt is mentioned in “Patchwork” and is an important illustration of applied work. 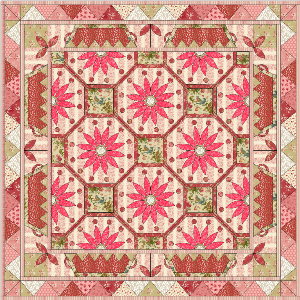 Permission to photograph this quilt for the publication is referenced to a Mrs Erith, of Dedham, England. The original size of this quilt is not mentioned. It’s unlikely that a working class woman would have had the time or resources to create such a quilt in 1790. Does this indicate the maker’s wealth and status? Who was she? What age did she marry? Who did she marry? Was she influenced by the popular and rival French fashion of the time? How much income did she spend on fabrics to make this quilt? Given this design fact I was surprised to noticed that despite her attention to detail, at certain points (such as the triangle border) it appears the she ran out of space as each corner is fixed differently. 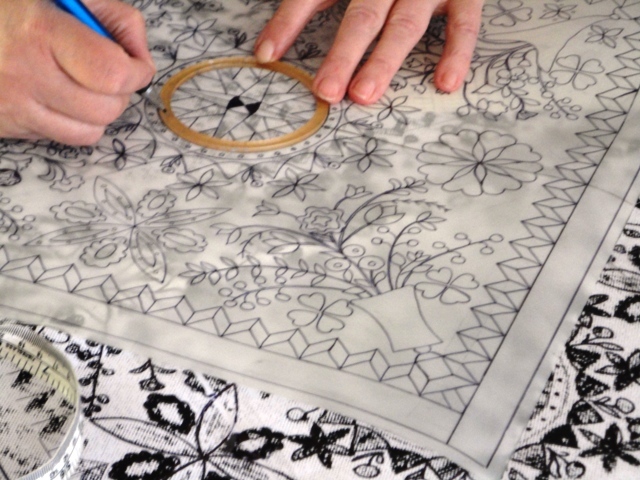 Given the planning required to cut the fabrics for this quilt and the maths required to create the symmetry which is evident in the design, are these ‘errors’ her own? Did she have servants work on certain stages of the quilt? Was it made between a group of women? Or was it simply an error of calculation (as unlikely as this seems)? It has taken me months to recreate the pattern, so I wonder where her source for the design elements came from? Were influenced by? Was it made intensely during a period of engagement or over an extended period of time? Did she make it alone or did she have assistance? There simply isn’t enough detailed information to know if the workmanship is consistent throughout or if it has differences which indicate lapses of time or shared workmanship. The triangle border mentioned above is a cause for question. Was it her own original design / pattern? 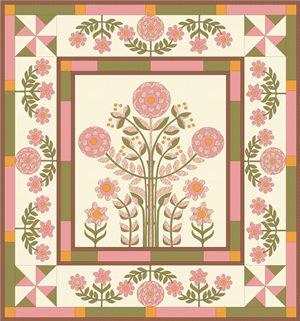 There isn’t any evidence that I know of to indicate that quilts were drafted and shared in a pattern or template form in 1790. 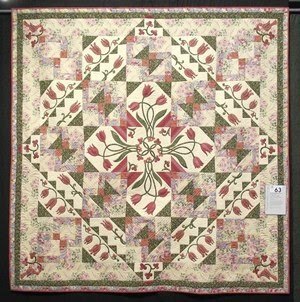 However, this quilt certainly does keep in with popular style elements of the time. So did she cut the templates herself or follow a guide? I’ve been thoroughly perplexed by this question – having worked on the quilt, I am sure that it’s design did not just happen. 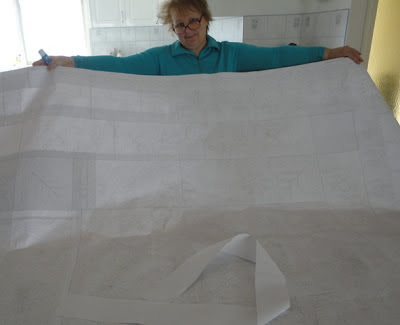 It contains much planning and drafting. But whose? Was she a wealthy woman? This is a large coverlet containing numerous fabrics and is totally appliqued! Even the zig zag borders! The design and flourishes appear to indicate a wealth of available time and dedication. What kind of education did she have? Did it include mathematics? 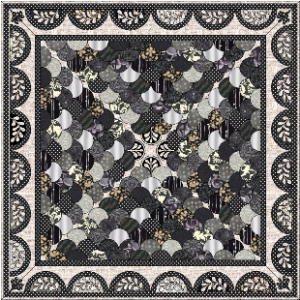 There are elements in this quilt that appear so easy, yet I had to really think and draft in order to make them work as effortlessly as they appear. I am referring in particular to the wreath borders which look so easy but caused me a lot of trouble to turn on the same line with leaves of the same shape. Was the quilt handed down as an inheritance or by some other means? Where is this quilt now? Is it still in its splendour, or has it faded? So many questions, so few answers. What I am sure of is that this quilt, if it survives someplace, deserves to be shown and known in the quilting community. It deserves to be regarded for its elements of style and place in history. 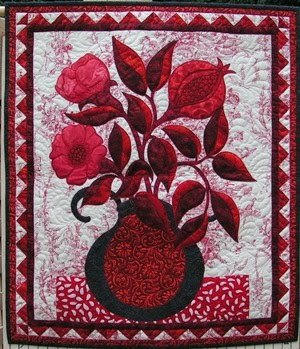 If at some point it does again emerge and can be referenced, then it will be a pleasure to have created this ode to its legacy in quilting. If it cannot be found, then it deserves to be celebrated and remembered. What I am certain of, what we can know for sure, is that this is a Georgian quilt. 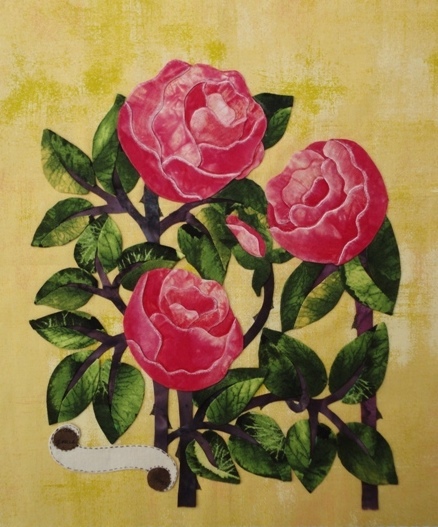 It’s unapologetic flourishes, its fussiness, its dedication to the beauty of the domestic. 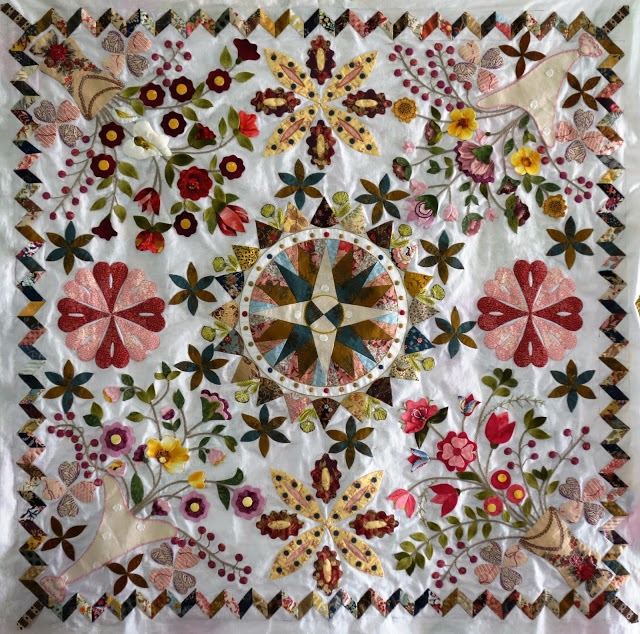 And so, I would like to call on all quilters, especially in the UK where this quilt was made, to look into your guild archives and groups and associations and find this beautiful, historic quilt. It must be somewhere. It's last reference is it's owner ( Mrs. Erith of Dedham) who granted permission for it to be included in the book 'Patchwork. It's important enough to have been featured in Averil Colby's book - so we know it has significance, but where is it? 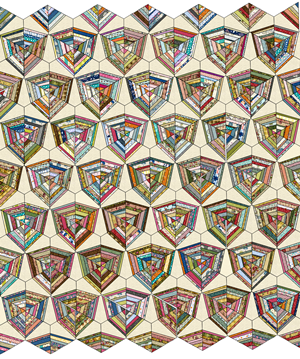 Have you seen this quilt? Please let me know anything you know and hopefully we can solve this mystery. Dear Members, if you're reading this post for the first time in 2016 I can tell you that this quilt was indeed found in the UK and is in private ownership. The owner has decided not to exhibit or release images of the quilt - a disappointing fact but one which we have no option but to respect. It is my hope that one day, the owner will realize that this quilt isn't just ' a quilt' it is an article of historic importance of women's textiles in the Georgian period. Naturally I'm very disappointed that the owner would not release images to the public of this quilt and that they have denied professionals to at least document the textile in it's current state for reference. It's my feeling that as time goes on, the understanding and appreciation regarding the importance this quilt has will increase. 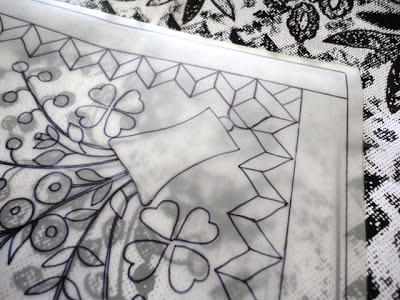 I hope by the time this happens, it will not be too late for the quilt itself. Simply washing it at this age would destroy much of it's historic value. This quilt belongs in a textile museum. 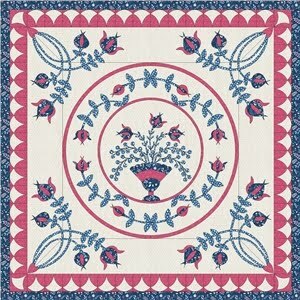 It was my aim to revive interest in this quilt by reviving its legacy at a time when it was lost and forgotten. 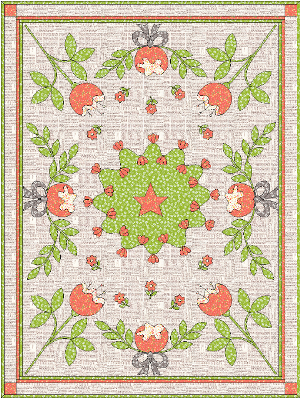 I released this pattern and it was available completely for free for over 18 months. In that time, the quilt was found and I feel that I have done all I can, as one person, to keep alive it's importance and value. Know that when you make your own LE, you are playing your own role in a long, historic story which will one day result in appreciation and acknowledgement of the original. 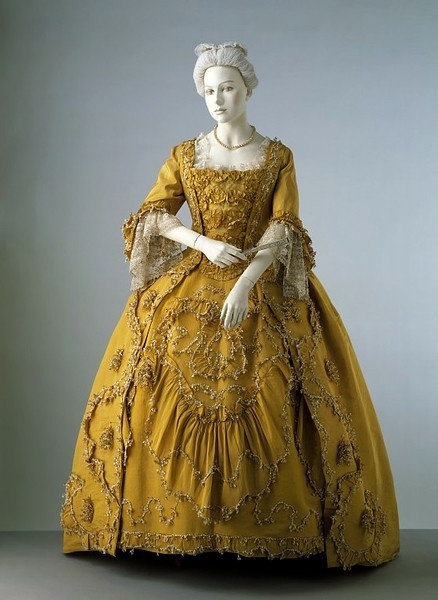 What a beautiful dress, and what an intriguing (era specific) colour. These two things are very much on my mind today; colour and design. What did Georgian England look like? 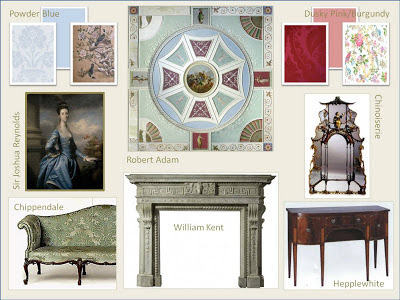 What interior colours dominated? Were popular? Were considered gaudy? 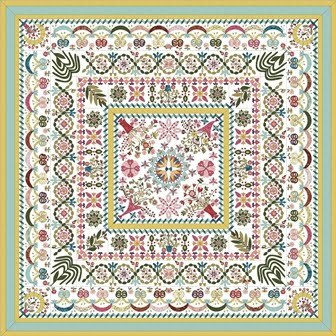 Which greens and yellows predominated and how quickly can I find some suitable Denmark Chintz? 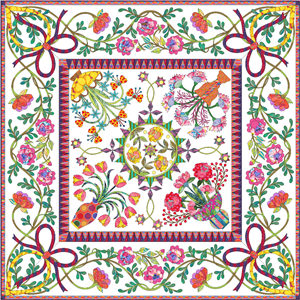 Who made quilts in 1790? What would that woman's life have looked like? What did she wear? Oh yes, I've got Georgian on my mind...can you guess why?